We value your privacy and will never share your info. You will only receive valuable info from us. Would you like to know where to spend your time on social media to grow your business? With over 1.5 billion people on Facebook, 200 million LinkedIn accounts, 500 million Twitter users, and the hottest social network for women Pinterest and Instagram are climbing the charts, there are incredible opportunities to develop your business and position yourself as a leader in your field. 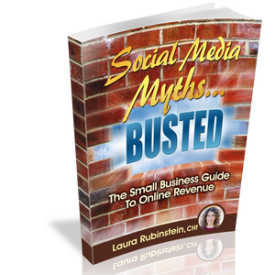 Digital Media and Relationship Marketing strategist, Laura Rubinstein, will walk you through the steps to growing your brand and building a buzz strategically on social media. During this presentation, your audience will discover:. Why social media is one of the best marketing tools for the small business. Which networks are right for your growth. Social Media Marketing Blueprint Steps. How to get Social Media Savvy and become a well recognized leader in your field. Copyright 2015 Transform Today – All Rights Reserved.